Drone Engagement Pictures Vancouver Lighthouse park - Best Vancouver wedding photographer Jozef Povazan Photography studio. 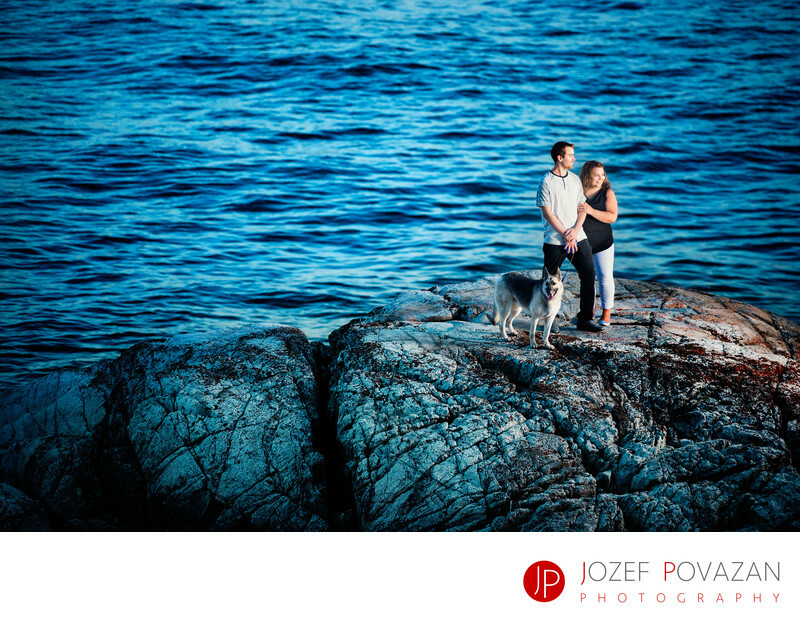 Drone Engagement Pictures in Vancouver Lighthouse park were created by Jozef Povazan Photography. Unique story by Award winning fearless wedding photographer who loves drama and creativity in his work. Destination weddings are very popular these days and C=D had their Caribbean celebration in winter away from this year cold winter. For this e-session shoot they asked me if they could bring their German Shepard dog name Nevada. I was in for the story and here they are enjoying the sunset above the Pacific ocean from one of the most scenic places in Vancouver - The Lighthouse Park in West Vancouver. If you think it was so easy to get them to pose like this you are so wrong. Nevada smelled all over the place everything she could and it was a fun work out for all of us to kind of get her where we wanted but with a bit of a patient we had the story running in couple minutes. Drone above their heads was so far and high they could not even hear the sound of the rotors, and since DJI Phantom has amazing flying behaviour it allowed me to create multiple angles and compositions within couple minutes of flying it. I have always dream to be able to photograph people like I was a bird and now I am in heaven. Thank you to all of you who loved the idea being drone-photographed :) I am so happy I can create these amazing art pieces for you and I believe this has a big future ahead. If you would like to know more what I could create for you, simply send me an email and let's have fun and create together. My name is Jozef Povazan and I am photographer with passion for being unique and modern at the same time. Cheers.